The nose is an extremely pivotal component of the face. The nose projects the most outwardly relative to the rest of the face, and is essentially responsible for creating the overall facial profile. 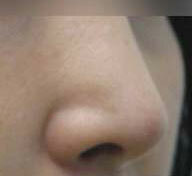 In Asian patients specifically, the nose is vital to the overall aesthetics of the face for several reasons. Eastern Asian and Korean faces are generally wider in comparison to the lateral length of the eyes. 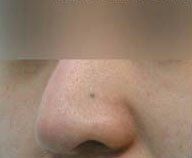 The nasal bridge is also relatively shallow, making the face appear wider than it already is. And lastly, an underdeveloped middle portion of the face creates flatness, which is only further emphasized by a protruding mouth. A shapelier nose is able to remedy this overall unbalance of the facial structure, bringing evenness, and therefore beauty, to the entire face. 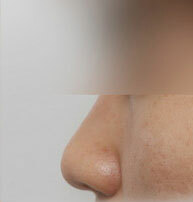 Korean Asian rhinoplasty, commonly known as a “nose job,” involves the restructuring of the nose, particularly between the nasal tip and bridge. The procedures generally enlarge the nose first, in an effort to balance the width of the face, and complement the distance between the eyes while lengthening the comparatively short Asian nose. The more detailed and technically complicated procedures add definition and shape to the nasal tip, which is the most crucial part of the nose. Korean rhinoplasty is often performed not only to produce an aesthetically pleasing nose, but also to improve the nose functionality. Typically, it is recommended that Asian patients get a nose that is less defined with a very slightly rounded nasal tip, which maintains the natural ethnic appearance. 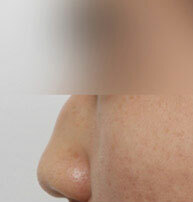 In Asian patients, the size and shape of the nasal tip – along and its relation to the nasal bridge – comprises the definition of a beautiful nose. Thus, it is crucial for patients to understand all of the options available before choosing to undergo the operation. Rhinoplasty surgery is so influential among Asian patients that it has become the second most common form of plastic surgery performed next to double eyelid surgery. For both men and women, there are general standards for the dimensions of a nose that will add to the overall aesthetic of a person’s face. In both men and women, the inter-ala distance (i.e., the distance between outer edge of one nostril to the other) should be 1/5th of the size of the face and equal to the distance between the inner corners of the eye. Additionally, the nasal length should be 1/3rd the facial length while the nasal tip’s height should be 1/3rd the nasal length. Aside from the general standards, there are separate standards for men and women when it comes to an aesthetically pleasing nose. For men, a sharper and straighter nasal tip gives a more masculine look. Thus, a masculine nose has a straight tip at a 95-105 degree angle; a nasal bridge that has a very straight edge or a very slight hump; and a columella (area below the tip of the nose and located directly between the nostrils) that is only slightly viewable from profile view. 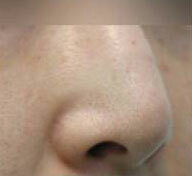 For women, a slightly softer and upward tilted nasal tip is considered feminine. Thus, a feminine nose has a natural curve at the lower forehead (below the brows), a straight nasal bridge, and a slightly upward tilted tip at a 105-110 degree angle. The purpose of Asian aesthetic surgery is not to replicate the look of any other ethnicity on Asian patients; the purpose is to enhance the features that patients already have. In other words, what appears suitable to one patient may not be as suitable to another. It is extremely important to consider the relative facial attributes in order to achieve the “ideal” nose for each patient. Please read the following instructions carefully and thoroughly in order that you (the patient) and your care-taker are familiar with the post-operative care for blepharoplasty. It is your responsibility to become well informed in the post-operative care instructions. Carefully following these instructions should help you get the best results from your surgery. Swelling: The amount of swelling varies from person to person, but swelling will accompany your operation. The swelling may become worse 2-3 days post-surgery, and it will start to subsidize after 4 days. – Standing up (walking, sitting, etc) and using 2-3 pillows at bedtime will alleviate the swelling. – Keep icepacks compressed on the eyes the first 3-5 days after surgery. Wrap the icepacks with a clean, new gauze and change frequently. – Bleeding may occur 1-2 days after your surgery. Wipe the blood off your face with a clean tissue or gauze. – Report immediately any signs of bleeding that persist after ten minutes of direct pressure, infection, redness, fever, unusual drainage, or pain. Dry eyes and ointment: Apply lubricating ointment (Lacri-Lube) over your incision lines 3 times a day using a Q-tip. At night, apply a small amount of the ointment inside the eyes to keep them moist. If you experience dry eyes, use natural tear drops 3-5 times a day as needed. Antibiotics: You must finish your antibiotics as instructed. Tape and dressing: If you had lower eyelid surgery, Dr. Kim may place a dressing on underneath your eyes. Very carefully remove the dressing 48 hours after the surgery. Diet: You may eat your normal diet after your surgery. Bath and shower: You may take a shower and shampoo your hair after 24 hours of surgery (48 hours of surgery for lower blepharoplasty patients). When using shampoo and conditioner, it is best to let the water/suds from the head flow naturally down your face. DO NOT rub your eyes and surgery areas. Exercise: Avoid strenuous exercise, and avoid lifting heavy objects and bending your head down for at least 1 month. In case of emergency: If you experience any chest pains or breathing problems after the surgery, please dial 911. If you have any question or concerns, please call our office at 213)700-4297 or Dr. Kim at 310) 880-8482.